Have you ever been in a group setting where one or two people dominated the group, leaving others feeling left out or unfulfilled when they didn’t feel comfortable sharing thoughts? Our Authentic Women Circles are created with a unique format, led by trained Peer Leaders. Our training assures that Circle are conducted in such a way that all women in the group have an equal opportunity to share thoughts and feelings. We are thrilled to have six wonderful Peer Leaders now able to offer Circles when they find a topic they want to explore with like-minded women. 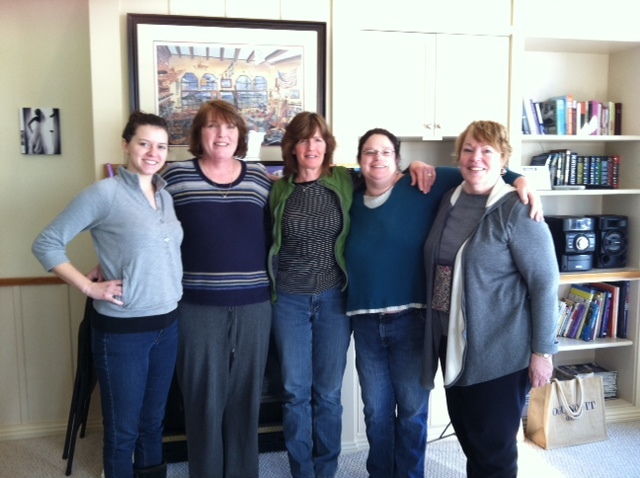 In addition to Authentic Women Circle Founder Kelly McCoy (who has been a Peer Leader conducting Circles for more than 15 years), we now welcome (L to R): Molly McCoy, Janice Wilson, Eileen Lawton, Mandy Boucher and Cheryl Boucher. We know all of them offer a gentle guidance that will make any Circle you choose to attend a wonderful experience. Peer Leadership is a wonderful experience that brings women together and has them leaving the weekend training feeling like they wish the whole world worked like this. Our Peer Leadership model can be learned by any kind, caring, interested woman. If you would like to explore whether you might like to take Peer Leadership Training the next time we offer it, please contact us.